I have a mole on the sole of my foot. My folks say that's the reason why I have itchy feet. Let me and my mole take you all over the Philippines and beyond. The last weekend of February had us driving to UPLB to fetch Ralph who went on an overnight debate competition. Since February 25 was declared as an official holiday, we thought that it would be the best time to spend the night at a resort in Los Baños. It was a last minute decision so I failed to reserve us a room at the Makiling Onsen Spa. 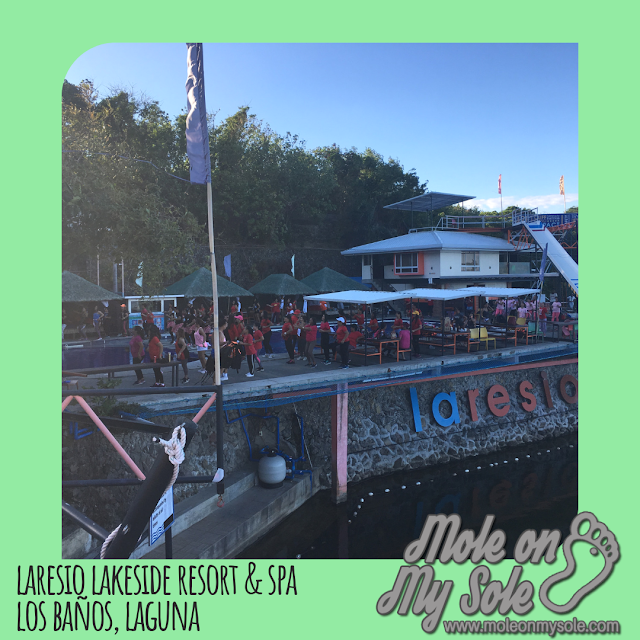 Thankfully, Laresio Lakeside Resort and Spa was just a few hundred meters and a phone call away. It was actually my husband first discovered Laresio Lakeside Resort and Spa. He saw a viral post on Facebook about it and tagged me. I didn't realize that it was also located in Los Baños until our car drove past its signage along the highway. Luck was on our side when I booked because there were still a few rooms available. As the night passed, we saw guests coming and checking in the rooms beside ours. We availed of the Small Group Overnight Package for 4 which cost us 1,500 each. Hello, I'm Mauie! I love traveling and discovering new, exciting places with my husband and son when I'm not busy with tasks in my work and in my ministry. For advertising inquiries and collaborations, you may reach me at mail@moleonmysole.com. The summer season in the Philippines almost ended with us not going to the beach. But it was a big deal for my boys. Since we were also celebrating my son's 16th birthday, we opted to make an impromptu trip to a beach resort just 3 hours away from our place. Funny actually, because it was only our first time to go to Real, Quezon. I made a quick research and the Internet pointed me to blogs mentioning a couple of beach resorts that are known as surfing spots. I wanted a quiet time with the family so I thought of finding other beach resorts in the area. Luckily, I found La Juliana Beach Resort and the reviews of the place are good. I have always thought of camping trips to be exciting but just thinking about the things that you'll have to bring discourages me especially when my son was still younger. Imagine having to bring not only a camping tent but everything a family needs to survive the outdoors. Buti na lang, nauso angglamping. What is glamping, by the way? An Urban Dictionary contribution explains the term glamping as a "shorthand for glamourous camping." Meanwhile, Merriam and Webster defines glamping as an "outdoor camping with amenities and comforts (such as beds, electricity, and access to indoor plumbing) not usually used when camping." Simplehan lang natin... For me, it's experiencing the outdoors more comfortably. And as first-time campers/glampers, we were happy that we chose to experience it at Casa Antonio Glamping in Calatagan, Batangas.